On April 28, we led guests through the veil of legend and reality to Discover Atlantis, that lost oasis of beauty and antiquity. What treasures and mysteries would be found under the sea? Guests arrived at the Shaw Conference Centre and entered an ancient agora. There was lots to explore, from the Dionysus Harvest of Grapes wine pull to the Ornaments of the Gods jewelry raffle with Hillberg and a Berk to the Greek Game of Chance. 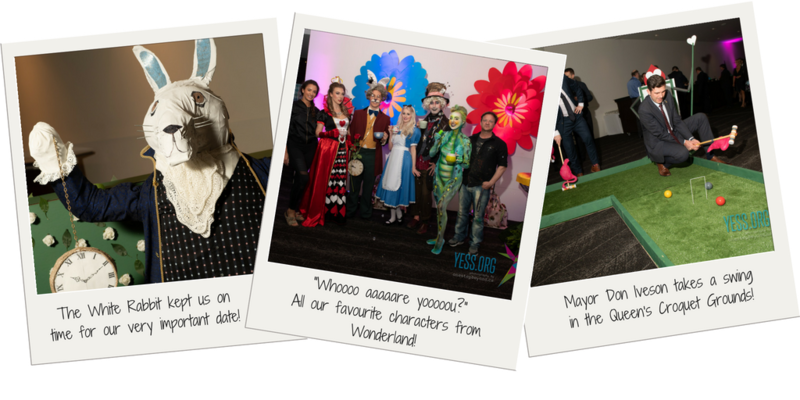 There was also a photo booth with One Step Beyond Photography. 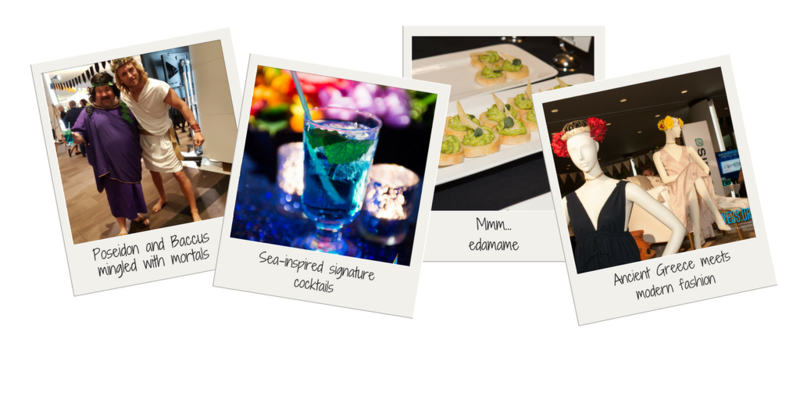 A signature cocktail reminiscent of the blues of the Mediterranean, sponsored by Impark, paired perfectly with hors d’oeuvres of tartar, edamame bruschetta, and–we were in Greece after all–spanakopita! Fashion displays by Simons set a classical mood with toga-like dresses and beautiful crowns. Then it was time for guests to plunge into Atlantis! Mermaids, octopii, and jellyfish floated amongst the pale pillars of the lost city. 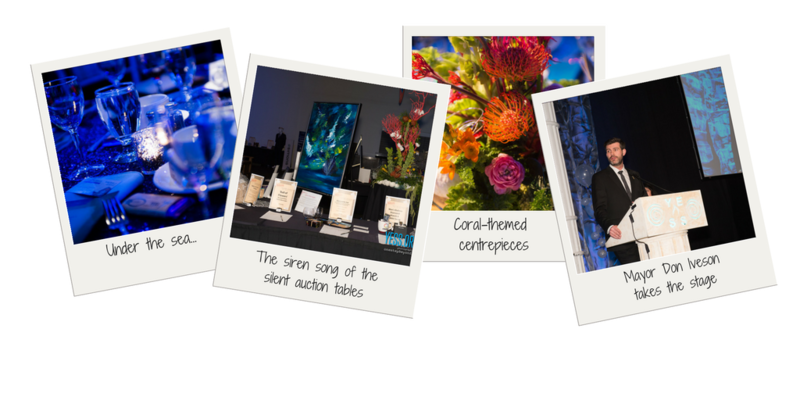 The many treasures of the silent auction sponsored by Canterra Suites Hotel enticed our guests. Tables were set with shimmering tablecloths in blue and silver. Centrepieces sponsored by MC College were inspired by coral and underwater flora to gorgeous effect. Each centrepiece boasted a pair of Sparkle Ball earrings by Hillberg and Berk available for blind auction, with all proceeds going to the YESS Health For 2 program to support pregnant youth. 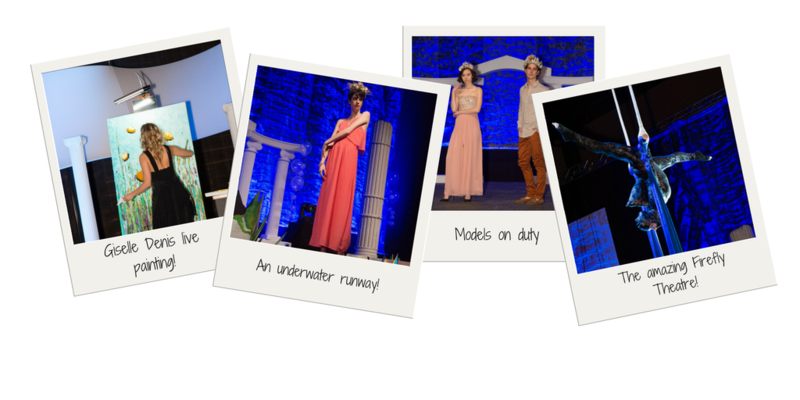 The booming voices of Poseidon welcomed guests to the kingdom of Atlantis. Greetings were brought from the Honourable Amarjeet Sohi, MP and Minister of Infrastructure and Communities; the Honourable Thomas Dang, MLA; and Mayor Don Iveson and Honourary YESS Patron Sarah Chan. Our emcee, auctioneer, and messenger of the gods for the evening was Mark Scholz. YESS Executive Director Deb Cautley spoke about the power of family. For the youth at YESS, sometimes family are people and positive influences they choose rather than the one they were born into. 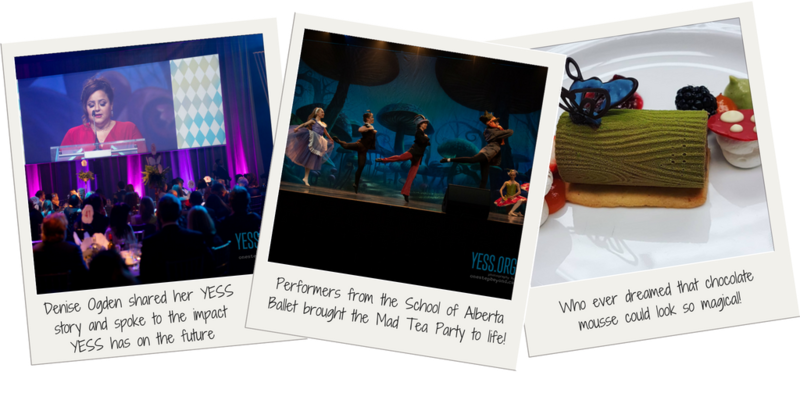 The experiences and relationships youth have at YESS can echo through the rest of their lives. Many youth return to YESS years after they’ve “graduated” from our programs, to share their new life milestones and successes with the staff who helped them years before. With the theme of family in mind, Deb welcomed former YESS youth Camille Ripley to share her story. Camille grew up with a difficult relationship with her mom and stepdad, constantly under threat of being kicked out no matter how quiet or out-of-the-way she made herself. Her worst fear came true when she was 14 and she came home to find her room empty and her belongings packed. Her parents had decided to send her to a foster home. Camille was eventually allowed to return home again, but only after her parents found out that she was being mistreated by her foster family. Life at home was as tense and difficult as ever. For her 17th birthday, Camille asked to stay with her aunt and uncle in Edmonton so she could attend an alternative school program. Her parents agreed and bought her a bus ticket. Camille started at a new school and made new friends who introduced her to drugs and alcohol that helped numb the pain and trauma of her childhood. It became too much for her aunt and uncle to handle and they asked Camille to leave. They gave her the address for YESS. Then it was time to enter the gladiator ring of the live auction sponsored by Carlson Construction–bidding paddles at the ready! Items like rare Burgundian win from Keith Graham, a pack from Blind Enthusiasm Brewing Company, a tour from Bioware, a travel package from WestJet and the Edmonton International Airport, top-of-the-line fitness equipment from Flaman Fitness, a year-long parking pass from Impark, a BBQ for 24 people from Tom Goodchild, a dinner party packed from YESS Chef Ellen Mitchell and River City Events/Big Top Tent Rentals Ltd., and a night on the town with a tailored suit to match from Simons, Mayfield Dinner Theatre, DoubleTree by Hilton, and Prestige Limousine, a division Greater Edmonton Taxi Service Inc. The rarest item of all came from the muse herself, Giselle Denis, who painted throughout the evening and auctioned off her masterpiece. A fashion show of the Simons spring/summer 2017 collection turned the acropolis into a runway! Models floated past in gorgeous modern ensembles and antiquity-inspired headdresses. Guests held their breath for the evening’s finale: an under-the-sea-themed epic by Firefly Theatre & Circus. Acrobats emulated deadly sharks, jolly crabs, and shipwrecked heroes to gasps and applause from the audience. At last it was time for the Lost City of Atlantis to disappear into the sands of time once again. But we privileged few now know its secrets, and perhaps a few walked away with a few treasures ourselves. 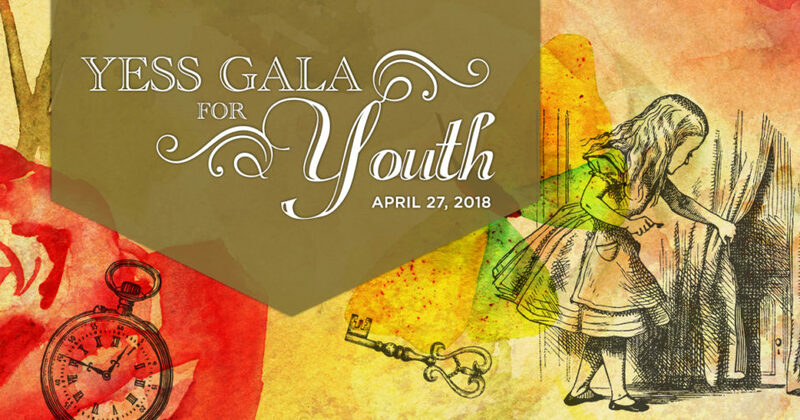 Thank you so much to all our guests, sponsors, hosts, volunteers, and staff who made the 2017 YESS Gala for Youth the most successful gala yet, raising $220,000. Your support of our programs and resources means our youth can discover their potential and find the support they need to bring their dreams to life. 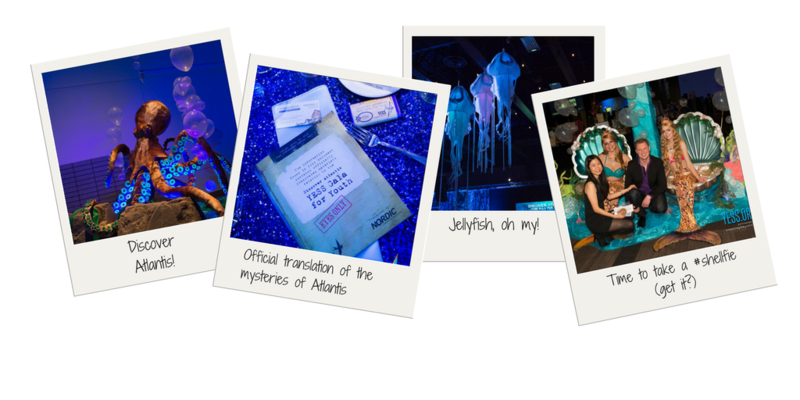 Relive the splendour of Atlantis with One Step Beyond Photography. Signage & Overall Sponsor: Cowan Graphics Inc.
On April 22, guests of the YESS Gala for Youth entered the moody metropolis of Champion City, a place of back-alley villainy and high-flying heroics. Who would win the night in the battle between good and evil? Guests arrived at the Renaissance Hotel and wove through the dark alleyways of Champion City to reach the super-secret soiree in the shadows. The Champion City alleys were the perfect place to mingle with Batman, Superman, and Wonderwoman on the lookout for trouble. Prowling through the crowd were Catwoman and the Joker. The elegance of themed cocktails and hors d’oeuvres contrasted with shady back alley dealings. The finest counterfeit Champion City Jewellery was on offer, and metropolis’ best libations were stashed in Lex Luthor’s Liquor Cabinet, sponsored by The Sherlock Holmes Hospitality Group. The Riddler offered the chance to beat him at his own game at the Riddle Wall, with prizes from Simons. Guests could also step right onto the cover of their own comic book at the photobooth provided by One Step Beyond Photography. At dinner, guests finally met their mysterious host: Lex Luthor himself, who claimed to be on the path to redemption and seeking a new place in society as a philanthropist. The Champion City skyline surrounded the ballroom, lit with spotlights of our sponsors’ own heroic logos in a presentation by Owen Brierley and Edmonton Digital Arts College. Tables were set in graphic black and white with the pop of colour of superhero-themed centrepieces, sponsored by Interpipeline. René Cloutier of Nordic Mechanical Services, Presenting Sponsor of the YESS Gala for Youth, greeted and thankedguests on behalf of YESS. The Honourable Amarjeet Sohi brought greetings from the Prime Minister and offered powerful words on the unified effort required to end youth homelessness. The dynamic duo of Mayor Don Iveson and Honourary YESS Patron Sarah Chan praised the community of YESS supporters in Edmonton. 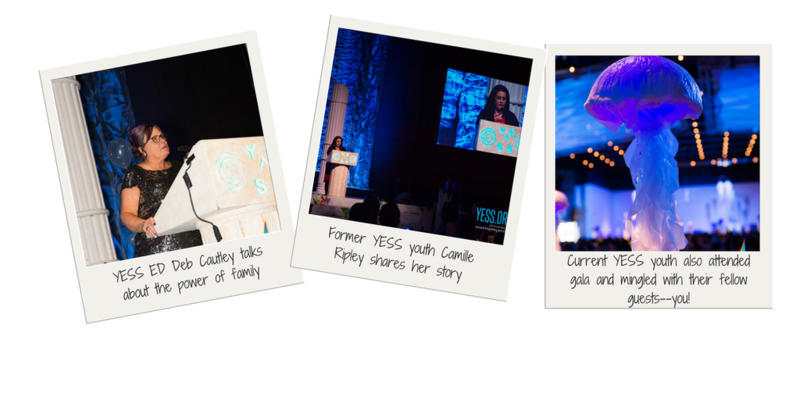 Deb Cautley, Executive Director of YESS, brought not a speech, but a story. The story of a boy who had been abused by his parents for fifteen years and finally thrown out of his home. He slept outside in a park near the house for five nights, then another two nights at the fence by the backyard. Finally he was allowed back in the house, only to be given a slip of paper with the address to youth shelter. For two months, YESS was this boy’s home. During the day he attended his first year of high school, and in the evening YESS staff helped him study and offered him support and counselling. It was the first time he felt like part of a family, the first time he had felt loved in years. The boy of this story then took the stage: Jay Ball, General Manager of FC Edmonton. Jay offered words of encouragement to the youth of YESS and praised their resiliency and the strength each carried with them—strength that could grow with YESS’ help. The ballroom erupted in applause for Jay’s bravery, wisdom, and strength. We are so grateful to have former YESS youth share their stories of hope and resiliency. Thank you so much, Jay, for sharing youth powerful words with our guests. 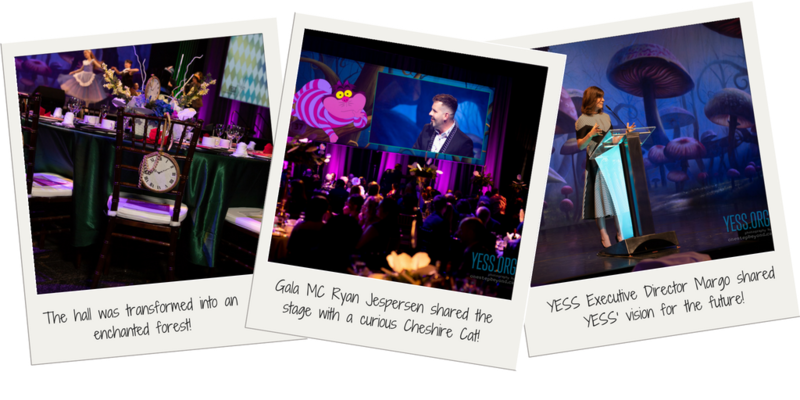 Even with Batman, Superman, and Wonderwoman in attendance, our guests proved themselves to be the true heroes of the YESS Gala for Youth, raising over $60,000 during dinner to provide basic needs to youth who are experiencing homelessness and need it most. Over 60,000 meals are served in the Nexus shelter every year, and the amazing support of our guests will go a long way in making sure our youth can always find what they need at YESS. The evening rolled on to the exciting live auction, emceed by the one and only Danny Hooper. Bidding took off faster than a speeding bullet on fantastic items like a trip for two to anywhere WestJet flies with all the EIA perks, paired with a condo rental at Big White Ski Resort (donated by René Cloutier, WestJet, and Edmonton International Airport), a trip for two to Yellowknife including flights, accommodation, and a golf package (donated by Canadian North, The Explorer Hotel, and the Yellowknife Golf Club), a barbecue dinner for 24 at the Sawmill Restaurant Group (donated by Tom Goodchild), and a masterpiece by Giselle Denis painted live at the gala! But the excitement wasn’t over yet. Lex Luthor took to the stage to reveal his whole bad guy-turned-philanthropist act to be a hoax! His fiendish ways still very much intact, Lex summoned his henchmen, the Joker and Catwoman, to rob the guests of their Champion City jewels. The villains ran rampant and Lex relished his victory—until Batman, Superman, and Wonderwoman swooped in to save the day! They apprehended the villains and march them out of the ballroom to cheers from the crowd. With our guests and their Champion City jewels safe and sound, Crystal Pearce from Hillberg and Berkmade a draw for much finer fare than back-alley baubles: jewellery sets from the collection at Hillberg and Berk. The evening drew to a triumphant close with the sweet taste of dessert—white chocolate cranberry tart, avocado ice cream, and macaron with dark chocolate ganache, made possible by Dentons—and the rocking sound of Samantha King and The Retrofitz. 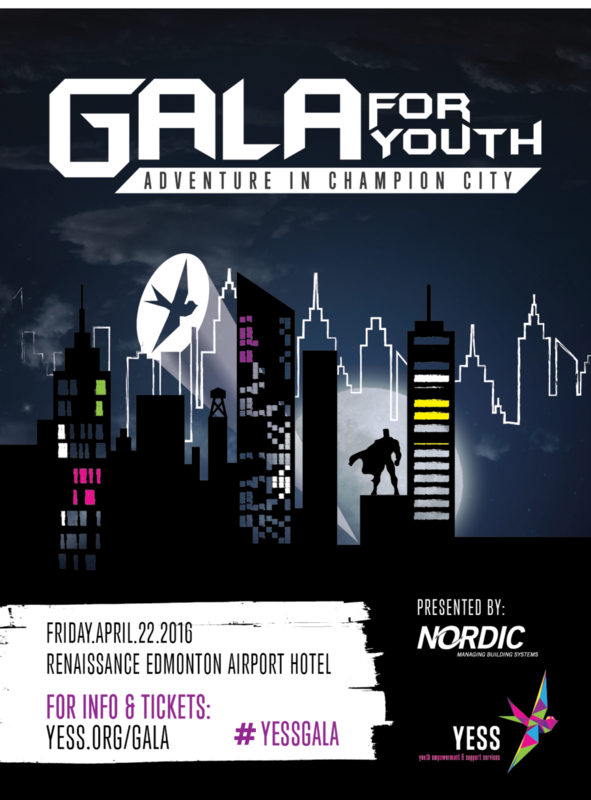 We would like to thank the superheroes of the YESS Gala for Youth: our sponsors, guests, donors, volunteers, and staff, for bringing this Adventure in Champion City to life. You helped us raise over $218,000, which will empower our youth on their journeys to brighter futures. To see all the photos that were captured in Champion city, click here, or visit www.onestepbeyond.ca!